Before learning about some of the most common hind leg problems horses can develop, it's helpful to understand a little about the underlying structures of the leg and how they should function normally. The stifle is the joint lying under the heavy muscle at the top of the back leg where the leg almost meets the belly. It is roughly equivalent to a human knee. (A horse's actual knee is more like our wrist joint.) There are several ligaments that control how the stifle moves and these are attached to some very strong muscles that run upwards along the horse's femur and downwards along the tibia. Like all joints in the horse's body, this joint is surrounded by a lubricating pad of fluid called hyaluronic acid or sodium hyaluronate. Along with this fluid, the menisci (a thick pad of cartilage) acts as a shock absorber for the joint. Muscles, tendons, and ligaments run along the long tibia and smaller fibula to the hock joint. The hock joint is another hinge-like joint about halfway down the horse's back leg. The small bone that forms the point of the hock is actually similar to the human heel bone. Six small bones make up this joint, and it is often the site of strain and wear. There is no muscle below the hock joint which is why the canon bone and splint bone feel hard, with little cushioning. It's also why this area is susceptible to injury, with only ligaments and tendons running down to the pastern joint. Stringhalt is the over-flexing of one or both back legs. It looks as if the horse is taking very high steps with the back legs. The horse will snap the hoof upwards and then stomp down. The flexing can be more subtle, however, appearing occasionally and may be more obvious when the horse is asked to step back or turn sharply. There are different types of stringhalt. Australian stringhalt is thought to be caused by a weed. False stringhalt may be caused by injury in the lower leg. The cause of unilateral and bilateral stringhalt is not known. Treatment sometimes includes removing a small section of tendon. Sometimes stringhalt improves on its own, sometimes it will get worse, and some horses will improve and then relapse. Many horses improve after being worked lightly and will be sound enough to be ridden. Bog spavins are caused by wear on the hock joint or an impact to the joint causing injury, like a kick. Conformation problems and mineral deficiencies may also cause bog spavins. Bog spavins feel like a spongy swelling around the hock. If they are caused by an impact injury, only one hock will be affected. If both are involved, the bog spavin is probably caused by a conformation fault that places strain on the hock joint. Bog spavins are unsightly, but many horses perform well despite them. If the strain causing the spavin causes undue wear on the joint, pain and lameness can occur. The excess fluid that causes the spavin can be drained but may reoccur. A diagram of a bone spavin. Bone spavins are caused by joint strain, concussion on hard surfaces, confirmation problems, and mineral deficiencies. 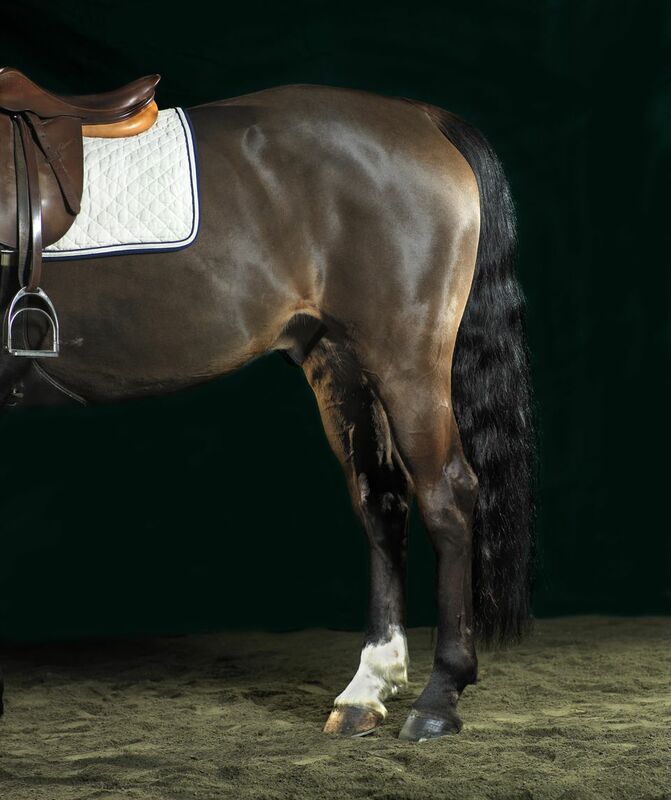 Horses like jumpers and reiners are susceptible to bone spavins. The hock joint is made of several bones and one or more of these bones can become affected. As hock flexibility is decreased, the horse may drag its hind toes and the stride is shortened. This causes the horse pain and can result in arthritis. Most treatments are of minimal effectiveness. Eventually, the bones will fuse. Horses will be sound but corrective shoeing may be required. Jack spavins are bone spavins that appear on the inside of the hock joint. The bony growth pushes against a tendon, which causes pain and makes the horse step short, dragging the toe of its back hoof. Thoroughpins are caused when the tendon in the upper rear hock area becomes inflamed. The swelling is visible as a bulge on either side of the top of the hock joint. (A bog spavin sits slightly lower.) Treatments are aimed at decreasing the swelling. Rest, blood plasma injections, cold hosing, topical sweats, draining, and radiation are some of the treatments that may help. Capped hocks are large fluid-filled swellings on the points of the hock. They can be caused by impacts and from lying on a hard floor. Thicker bedding may help alleviate the problem. Similar swellings can occur on the horse's elbows. 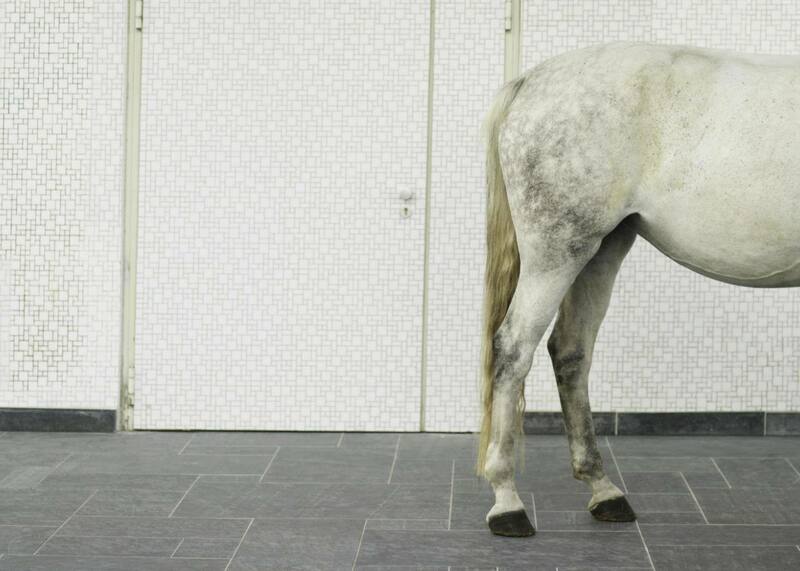 The horse is unlikely to be lame. The swelling can become quite pronounced. Treatments include cold hosing, steroids, and drainage. Most resolve themselves to some extent without treatment and they are unlikely to affect a horse's performance. Curbs are inflammations of the upper hind area of the rear cannon bone. They are caused by an impact, such as a kick, that strains the plantar tarsal ligament. Slight lameness may accompany the swelling. Rest is the only treatment, and although some fluid may remain.